Japanese wisdom has it that you're a fool if you've never climbed Mt. Fuji; also that you're twice the fool if you climb it more than once. By this definition, I'm no longer a fool, but I have no intention of re-attaining the status. Reaching the top of Mt. Fuji --"Fuji san cho" -- is a must-do of Japanese life, though fewer than 0.5% of the population ever make it up. The normally snow-capped dormant volcano appears in what seems half the paintings in Japan, and companies named after Fuji are as common as AAAAcme Plumbers in a US phone book. In fact, few people see the top in real life without the hike. It's normally obscured by clouds. The surprise for a hiker is that the cloud layer is only part way up the mountain. Upon reaching the summit there's a view of the cloud tops like that out an airplane window, augmented by a giddiness that has as much to do with the fact that the climbing is over, as it does with the sparse oxygen available at 12,388 feet. 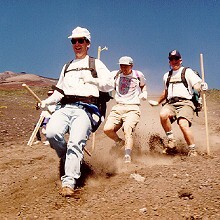 Tackling Fuji is not a standard part of most packaged tours of Japan. There's lots to see in Japan that is much easier to reach than the top of Fuji. The temples, shrines, castles and restaurants can mostly be approached by some efficient combination of shinkansen (bullet train), chikatetsu (subway), and takushi (taxi), without stressing your quads and blistering your feet. 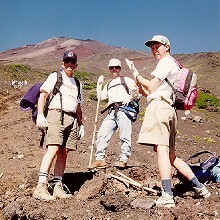 My reluctant overnight scaling of Fuji was with a colleague while visiting Japan on business. I had last climbed a mountain when they were still cleaning up from the original Woodstock. My aging Boy Scout gear and my sleeping bag with the cowboys on it wouldn't do for this trip, so I spent several hundred dollars on getting ready: good hiking boots, day pack, down bag, breathable rain gear, the works. My hiking friend has scaled most major peaks in the US and a good part of the Appalachian Trial. He has all the right equipment. He also signs my paychecks. I was seriously worried about being shown up on this trip. We had intended to do this alone, but as with many of our adventures in Japan, our Japanese hosts worried about us. 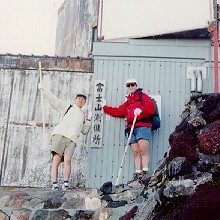 Two Japanese volunteers met us in Tokyo and guided us to and up the mountain. One of our guides was president of his company's hiking club. He showed up with all the right gear, and a good deal less bulk than me, whether measured with or without the pack. Lean and mean. To make me feel better, though unnecessarily poorer, the other guy came in tee shirt, shorts, a pair of basketball shoes, his daughter's book bag and a plastic poncho. He hadn't done this before. Several approaches to the summit exist. Most reasonable fools start with a bus ride as far as possible, to what the Japanese call "go-go-me" (fifth station), which is about 7500 feet above the Pacific. Four different go-go-me exist, each reachable by bus, generally with two or more trails leading to the top. We chose the Lake Kawaguchi ("Kawaguchiko") approach, away from the ocean hoping to descend on the opposite side, looking out at the Pacific. On a stifling hot, muggy day in July we bought tickets at Shinjuku Station in Tokyo for the three-hour bus ride. One way was 2900 Yen (about $29). At go-go-me are several restaurants and gift shops. More important, there is a store to buy Fuji Sticks. For 1000 Yen (about $10), this indispensable walking stick provided both physical and moral support for the ordeal. As we worked our way up the mountain, we earned the right to get a "chop," or seal burned into the stick to prove we had made it at least that far. (In addition to the legwork earning this right cost us 200 Yen [$2] per chop.) More than once the only thing keeping me going was the prospect of returning without a completed stick. That, and the fact that my aging (well, five years older) hiking buddy was hot on my trail. From go-go-me to "ju-go-me " (tenth station, the top) are four more way stations and several sub-stations, each providing rest, refreshment, and the Fuji chops. The stations are generally one-room shacks with corrugated metal roofs secured from the persistent winds with lava stones. The stations provided some food, and all but the top had water. Beer, sake, all the squid you can eat, sweet rolls, coffee and green tea are available at most stations. Compressed oxygen canisters the size of a whipped cream can are sold for 1500 Yen ($15). At the eighth station on our trail was the "Fuji Hotel," where a couple dozen souls can spend the night two to a hard 3' X 6' bunk, no heat, for about 3000 Yen ($30). We stopped at the eighth station for an extended break. It had started raining, had become a lot cooler, and the air was getting thinner. Actually, the climate hadn't changed; we had hiked into this climate, into this layer of clouds. I was trying again to remember why we were doing this. The coffee we had at this station was presweetened; I normally would hate this, but it tasted great, was warm, and the caffeine helped at this altitude. We huddled around a small cookstove along with a few other warming bodies for half an hour or so. It got steeper after this. Although it wasn't technically climbing with pitons and ropes, the non-Rambo's among us had to use our hands a lot. Bring cotton gloves if you come. We had passed 10,000 feet by this point, an altitude at which pilots in non-pressurized aircraft don oxygen masks. Susceptible people can get "altitude sickness" at elevations above 8,000 feet (see box). Trained athletes initially have trouble exercising in Denver, Colorado--at 5,280 feet. I'm not a trained athlete. We had over 2,000 feet to go. It was getting tough, and we were getting silly. Each step was a chore. 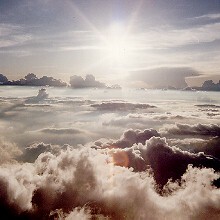 Somewhere between there and the top we rose above the clouds, with the sun starting to go down behind a ridge. Looking down in the brightness at the shadow of Fuji, we saw a curious moving black human shape in the clouds, as if we'd left a hole where the trail emerged from the mist. A rainbow encircled the shape, ground-to-ground. The shape was my shadow, probably the only halo I've ever had. Nearing the top, out of breath, we passed through an archway, up some final steps, and reached the summit, six hours after we'd started. There's a small Buddhist Temple there, with a stone wall overlooking what seems to be most of Japan, looking down, way down, on the clouds. A young woman who had just arrived was bawling her eyes out, laughing, and hugging her boyfriend, she was so excited. It's that kind of feeling. Well, pictures all around. Packs off. A little toast. Whew. Couldn't have gone another step. Then, an American soldier chugged by from the other direction. "Aren't you guys going on to the top?" The official top, the 12,388 foot spot, is at the weather station on the other side of the crater rim, 75 feet higher and forty-five minutes away. We made it, and now that we're down, this former fool will never part with that ugly, scratched, blister-causing Fuji stick. High altitude, or mountain, sickness is a self-limiting disease that anyone that goes too high too fast will experience. It was recorded in ancient Chinese writings more than 2000 years ago. Armies traversing the 16000 foot Kilik Pass in Afghanistan described it as "the great headache mountain." Symptoms of mountain sickness include headache, shortness of breath, dizziness, insomnia and nausea. These can begin as soon as four hours after reaching heights over 8000 feet. The atmospheric pressure in a typical commercial airplane is equivalent to 6500 - 7500 feet. Humans can easily adapt to living at high altitude; indeed, 40 million people currently live above 8000 feet. The trick is to take one's time acclimating. As our civilization becomes more mobile, we are arriving at higher altitudes more quickly than ever before Typically, taking one day for each 1500 foot change in elevation between 5000 and 14000 feet is recommended to prevent common symptoms. Now we see ocean-level dwellers, like this writer, traveling from sea level to lofty heights in twelve-hour periods. Time is not something most of us have in excess. 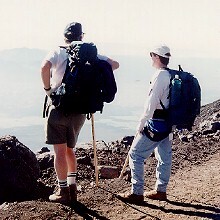 The main cause of acute mountain sickness is lack of oxygen, but it is not the lower oxygen per se that is the problem. When the oxygen in the air decreases, your body tries to compensate by breathing more. But, breathing has two purposes: to bring in oxygen and flush out carbon dioxide. If you breathe more (e.g., hyperventilate), you flush out more carbon dioxide. As carbon dioxide is cleansed from your body, blood becomes more alkaline. This "alkalosis" is thought to cause most of the symptoms. Acetazolamide is one medication that works quite well in preventing mountain sickness. It works in part by making the blood more acidic. It is also a mild diuretic; drink plenty of water. You'll need to consult your doctor to see whether this is appropriate for you.